words are said to be eaten and the stomach filled with them. From William Wyatt Gill, Life in the Southern Isles; or Scenes and Incidents in the South Pacific and New Guinea (London: The Religious Tract Society, 1876), pp. 29–34; engraving p. v.
Many of the Polynesian flood stories collected in the 19th c. have overtly Christian overtones—only one man and one woman survive, they take their animals with them to higher ground, sometimes they are explicitly being punished. But a few flood stories were recorded that exhibit a different logic. In one, recited by a Tahitian tahua (priest) to an English missionary in 1822, the deluge is caused by an ocean god named Ruahatu-tini-rau who becomes angry when a pair of fishermen drop a hook on his head while he is napping in his coral grotto. The god gives the fishermen time to get their families to an islet where they will be safe, but warns them not to delay. "I am vexed with you for disturbing me," he says. "I will not only pluck the tips of the branches . . . All Ra'iatea shall certainly be destroyed." There follows a quite amazing description of the coming of the great wave and the destruction it leaves behind. 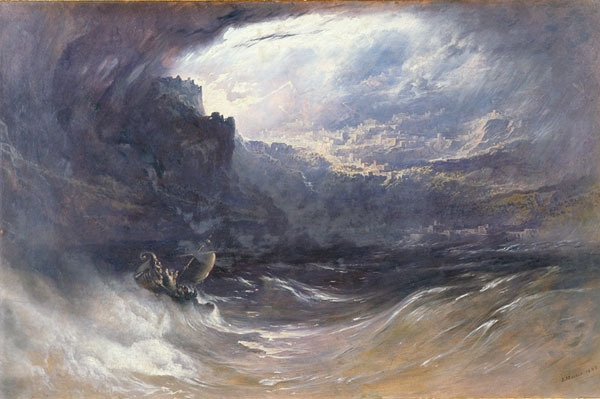 "The Deluge" by John Martin, 1834. Oil on canvas. Yale University. The people looked toward the land and saw that the branches of the trees were all broken and uprooted, and the sea along the shore was mixed with debris from the soil . . . they saw slimy rocks, branches of coral, and dead fishes and shells of Mollusca scattered over the shore. . . . There were no houses, the temples had fallen down; there were no birds flying about, no pigs uprooting the earth, no fowls crowing, no dogs running about, and there were no fruits upon the clumps of trees. All was desolate, all was swept clean.